Follow the story behind the restoration of our historic Robey engine from 1915. Hollycombe Steam in the Country has committed to a project of significant historic importance. Using the sole surviving Robey semi portable steam engine and associated machines we intend to recreate a working first world war sawmill. This is an exciting project which will give a fascinating insight into the importance of timber production during World War One and really bring the past to life. Wood was the life blood of trench warfare fought in France on the western front. Vast quantities of timber were used meaning many woods were earmarked for felling to support the war effort. Temporary sawmills of the type we are recreating were set up all across the country. An account from the time was published in Country Life in 1916 http://plattmemorialhall.org/warmemorial/world-war-one/platt-woods/ . The destruction of Platt Wood is one example of many thousands that took place during World War One. With man power short Canada answered the call with skills in forestry it was obvious that they could help with the production of timber for the war. Formed in 1916 and disbanded in 1920 the role of the corps was to provide the western front with the timber it urgently needed. At first this was the woods of Canada who but quickly it became obvious owing to the shortage of shipping the Canadians needed to fell timber in the UK and then France they went on to produce 70% of all wood used in the allied trenches. One tree cut down by the Canadians was the William Conqueror Oak that stood beneath the King’s window. The tree had a circumference of 38 feet and, since no saw was long enough to cut through the tree, the Canadians cut a hole into the trunk which enabled them to pull a saw from the inside of the tree. So how do the Canadians relate to our sawmill? The Deers Hut in Liphook was the site for a steam powered sawmill set up by the Canadians to process the timber required for the western front and by the end of the war it had produced a staggering 111,111 tons of timber. This is the equivalent of around 15 Eiffel Towers! The following is a quote from the book written by Charles Wesley Bird on the operation of a Canadian steam driven sawmill at work in the first world war just like the one in Liphook. The mill itself is a stoutly-built structure, made of timber cut and prepared on the spot, the saws and engines coming from Canada. It is practically a raised platform covered by an iron roof, but open at the sides. A log to be sawn is rolled into position on a ' carriage,' which moves backwards and forwards to carry it through a circular saw. Two men, standing on the carriage, control its movements and the position of the log by a number of levers. Opposite them stands the most important man of all, the ' sawyer, ' whose trained eye sees at a glance what can be made of this or that log. The hum of the engine and the screech of the saw would drown his voice, so he gives his decisions by signs. As the carriage brings a log back through the saw with the bark removed, he will hold up one finger or two, and the ' setter ' on the carriage, by the movement of a lever, adjusts the log so that the next cut shall be one inch or two inches thick. A camp near Bramshott near Liphook was established and became home to some of the soldiers from Canada 700 arriving in May 1916 this grew becoming almost a small town complete with high street. The camp occupied the left side of the A3 when you travel from London starting by the now derelict Spaniard pub carrying on until the brown Hollycombe sign on the A3. The maple trees planted along the A3 still act as a memorial to the soldiers from Canada who helped us with the war effort. What did our engine do in World War One? 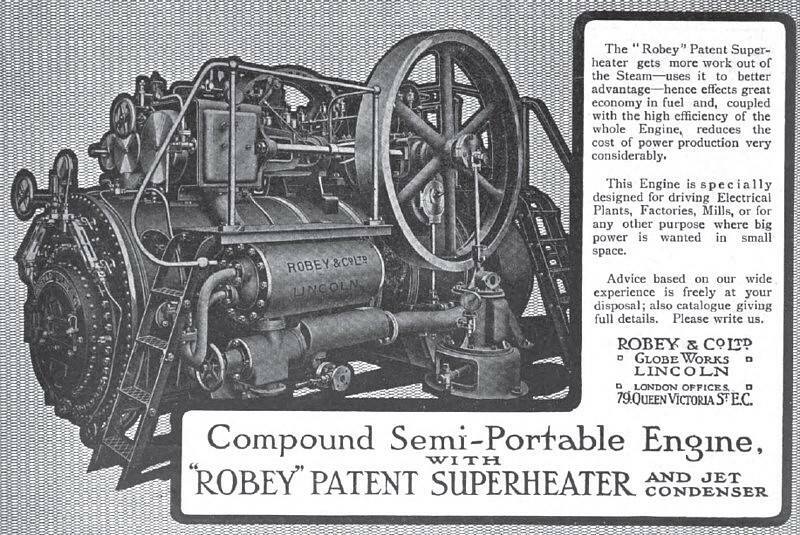 For many years it was believed that our Robey engine had been supplied to help the war effort within the timber industry. However after more in depth research new evidence points to a very different, but equally important use for the engine in the beginning. It was well known that the engine finished its working days at Beechwood Brushes Ltd in Chesham. By the time it ended up in Chesham it was direct driving an alternator from its left side fly wheel. A photo of the engine can be seen in the Volume 6 of Stationary Steam Engines of Great Britain. Belgian connection - Having established a the delivery address of where it had come from it is now believed that our Robey engine had started out at the Pelabon works in Richmond. If correct this gives an amazing link to World War One. In 1914 after the fall of Antwerp 6000 Belgian refugees escaped to Britain and made their home in Richmond on Thames. Of those who escaped there was a man by the name of Charles Pelabon who had previously been running munitions factory in Belgium. Monsieur Pelabon was a dynamic Frenchman who with his specialist knowledge and experience went about setting up a munitions factory in Twickenham. The British government at the time helped him secure a suitable location at the site of an unfinished ice rink in Richmond and by the summer of 1915 he had started production of hand grenades. The munitions factory was unique in Britain in that it only produced for the Belgian army and by the end of the war employed more than 2000 people, most of whom were Belgian themselves. The full story of Charles Pelabon and the works can be found at https://www.bvott.org.uk and https://easttwickenham.org/ww1-belgian-refugee-project/history-of-belgian-refugees-in/ . How can you help? There are many ways in which you can help us. We would like to know more about the story of our Robey engine. We know it was built in Lincoln by Robey in 1915 and delivered to the Pelabon works on the 1st January that year. What we would really like are photos of it at work or specific details of how it was used. The works closed in 1922 so any information for the seven years it spent at the Pelabon works would be greatly appreciated. We would also be grateful for any donations, whether financial, or in terms of any support you can give us with recreating the sawmill and getting engine working again. Our Robey engine has been with us since 1971 and operated here between 1974 - 2008. We are always on the look out for volunteers and if you have a passion for history and you would like to help us preserve the memories of the past then please get in touch. If you would like to keep up to date with our progress visit www.facebook.com/treestothetrenches and follow the story.